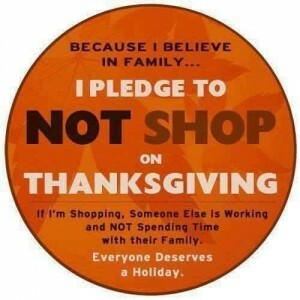 Someone posted this graphic on Facebook awhile ago, presumably in response to news that Kmart will be staying open for 41 hours straight, beginning early on Thanksgiving Day, (for non-Americans reading this, Thanksgiving falls on a Thursday every year, and big sales happen the Friday after stores have been closed for a day.) and several other major retail chains will have opening hours actually on Thanksgiving Day, not the traditional early morning hours of the following Friday, for the “Black Friday” sales. Of course, even though I agree with this graphic, one must also remember that many/most? work on holidays FOR family. They need the money. Living wages are low, and holiday pay is simply higher. “The difference between a production society, which focused on meeting basic needs, and a consumption society, which emphasized customers’ wants, was like the difference between a 1908 Ford Model T and a 1959 Ford Galaxie. The Model T, available only in black, was a utilitarian piece of machinery intended for basic transportation. The Galaxie, decked out in shiny chrome, was a way to show off and to enjoy a sense of luxury, not just to move from place to place. Within a year or two, it would be obsolete as fashion changed. Blessed with abundant resources, America could afford to turn part of its productive capacity to creating glitz and fashionable waste. An older generation was careful to save and reuse; Americans in the Fifties began to use and throw away. They became ‘consumers.’” For full article click here. Coming from the deprivations of a World War, the temptation towards consumerism was overwhelming. Add to this that the “powers that be” figured out that planned obsolescence would fuel faster turnover, and the marketing world figured out how to make consumers desire things they don’t even need. We became a consumer society. …and parents started giving “things” instead of time to show their children love. We have created a modern version, here in the United States, of debtors prison. And we have people who no longer know how to interact with one another if we feel the only thing we have to offer is ourselves. And we exported this vision of ourselves, and set about converting the rest of the world. Please don’t get me wrong on a couple of points here. There is nothing wrong with having those “things” as long as they are not defining your life, and are merely enhancing it. (Even that statement must be caveated with the knowing that manufacturing, as we know it today, is taking a huge toll on natural and human resources, which is an entirely different discussion.) I know full well that having enough money to cover, at the very least, basic human needs, takes a huge strain off of relationships, and facilitates life. I also know that the role of women in this world has to shift, and that “women’s rights” is not a dirty little phrase. In fact, I believe it is the key to changing the direction of this country, and the world. Women did, indeed, in the 1950’s and especially the 1960’s, step into the current power paradigm, which, obviously to most of us, is not working. But we are in the next phase of recognizing the hole that we have dug for ourselves. I also believe that it goes against our nature to stay in that energy. This is a discussion that I have actually had elsewhere on in this newspaper as well. Still, even in the old paradigm, women began to teach, if incompletely, that there really IS a different way to view one another. Unfortunately, in most cases, the change was external…men doing dishes, washing clothes, housework…but then it became more subtle. It became okay for men to share the child-rearing responsibilities… and who is the mentor in this situation? The woman. Now we have men recognizing their own gentle strength, and men and women teaching this to their sons and daughters. Right now we still have too many women so wrapped up in the power paradigm that they don’t even, necessarily recognize that they perpetuate the paradigm that says they are less than. But this next phase is happening. Women, when they are balanced and spiritual and assured of who they are, will be the ones to raise the boys who know the same…and then men will also know their own true power and be allowed to put down the burdens of the current use of that power. Balanced women. Balanced men. New paradigm. Children who feel connected to family for a lifetime. No need to outsource happiness and still feel empty. No need to shop on Thanksgiving? Time to begin living and feeling a new “Oneness” concept? Time to truly be Grateful? Wow, K-Mart is American. They are in l’il old New Zealand but I thought they were Australian. Boy it gets worse. Open til ten pm every night here anyway!